25th November, 2006 has been etched in my mind as a day when I experienced something truly different in my life. 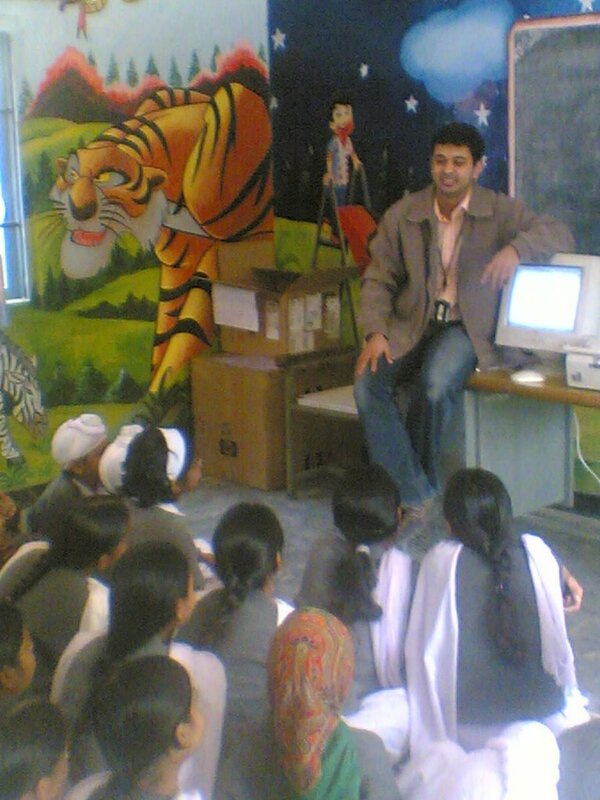 Today, I was a part of Rural Reach program which has been started by Infosys. In this we had been formed into 10 teams of around 6-7 people each and were assigned 10 different schools in near by rural areas. 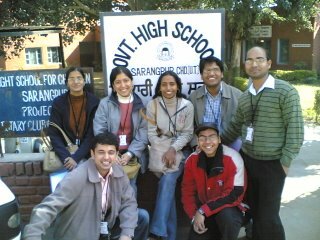 I was a part of 7 member team which went to Govt High School in Sarangpur. In the morning the taxi was preloaded with a desktop, some refreshments, gifts and mementos to distribute among the students. 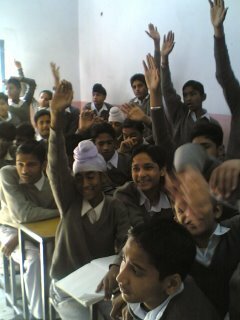 The plan was simple - reach the school at 9.00, interact with principal and faculty, start the session at 9.30. Continue till around 1.00 and return back to infy by 1.30. Pretty straightforward. We were also given a CD with PPT’s to show. As we reached the school, this is how the things unfolded. As we identified the school from the main road, it seemed a small school. 3-4 year olds were playing outside. It was like – Are we going to teach kids like these?? The school building was small. And the talks among us brought out the apprehension of not getting enough students as audience. So many times it happens that first impressions are wrong. As it turned out later, the team interacted with around 300 students from class 5th to 10th. We met the principal and were offered excellently made tea. Discussion carried on, on how to divide the groups and take sessions. But I guess in cases like these, theories are just useless. You have to get into practicalities. Had we kept on sitting, we wouldn’t have come to a conclusion even after hours – happens so many times in meetings. As two ‘practical’ school staff entered the picture, things started to shape up. Within minutes we identified the rooms and they took responsibility to fill in the students. Problems had just started. We got a rude shock as we saw only a packet of some 20 chocolates, few pencils and pens as gifts. Sensing we would be addressing large number of audience, we needed more incentives. Nimesh took the responsibility of bringing in more stuff as we pooled in more money from our side. How much difficulty he had in getting chocolates and toffees in a rural area in the early morning hour – we will never come to know. But rest of us had some problems of our own to handle. Girls – Surabhi, Swati and Vandana took the responsibility of facing classes below 7th and going by the response we saw from those kiddies later when we were leaving, I was sure they had done an excellent job. Moreover, I felt that girls were more adept at handling small children rather than the higher classes who can get rowdy. The students were from very poor families as the relatively rich had access to schools of big towns nearby. There was a computer fees levied which was a deterrent to students enrolling for computer course. Though they were trying to bring the fees down. Students were not interested in joining the course because to them, it was just useless as regards to future job prospects. This point, I decided to concentrate on while addressing the students. The subject syllabus involved from basics till HTML to class 10th. Frankly that was a shock for me. I didn’t know what HTML was till college. Moreover, we had been told that some of the school children didn’t even know what a computer is. And here they were learning HTML. We were in for more pleasant shocks later on during the interaction. The second computer we took to room 2 under the glare of students. There was no power here. The person told that room1 had the power switch. So we moved the extension wire to room 2. But the switch in room1 didn’t work. So I rushed with a school admin person to nearby shops. After a long walk, one of the shopkeeper gave us the extension. During the walk, the admin person made me privy to the politics going on in the school. He had his own problems to rue about – about the biased principal, the arrogant right hand man, the rogue students who had no sense and who created nuisance 24X7. What I felt afterwards about the children was very confident, eager to learn, largely without inhibitions with good learnability. If that is called rogueness, senselessness – well I beg to strongly differ. Yes, there are some naughty ones but what I feel is they can be moulded easily. I mean, I now see some of my naughty school mates – I can’t believe how time has changed them. Now after most problems sorted out, the sessions began. Anoop and Rajendra were in room 2 with classes 8th and 9th while Nimesh and I took up room 1(classes 7th and 10th). It was 2.5 hours of plain fun and eye opening after that. The PPT’s given by infy were not opened once. We started with paint brush. I wanted to convey the point that learning computers has a great benefit in future as regards to high paying jobs as well as basic jobs. And this Nimesh and I conveyed pretty effectively – going by the responses later. I had not really imagined that we could carry on for 2 -3 hours, but when it started, everything just flowed. To our surprise, they knew stuff which even I didn’t know even till college. They drew in paint, opened word docs, changed the font, color of text. One of them even wrote his name in power point and made it appear in a stylish way in the slide show. I was impressed and guess, so was Nimesh. I thought knowing the full form of HTML was the high point. The chap who told seemed from a poor bihari migrant family but had the air of the studious kinds which we all must have encountered some time or the other in our lives. We gave them info about the internet – the basics of how it worked. What are the uses it has – about email, chatting. What is the use of screen saver, how to change wallpapers etc. To make sure it was drilled down in their soft minds, we got it repeated over and over. In between, to have fun they were asked to perform some songs, dance, jokes etc. This was the time to see their confidence. They were literally fighting to come on stage to perform. We had jokes, dances and lots of Punjabi songs. Also, we asked history, geo, maths questions. Not everyone knew the capital of Karnataka ,but everyone knew the local geography – capital of India, Punjab, Haryana. Strangely Trivandrum was quite popular. The 1st answer when asked about capital of a southern state came as Trivandrum. I guess only 1 was aware of ‘father of nation’ while most knew Bhagat Singh. Shahrukh Khan, Kareena Kapoor, Kajol, even Manmohan Singh and Abdul Kalam had the reach which Gandhi did not. We had problems of language here, as they sometimes didn't understand what rectangle or geography or trignometry was and we got confused between 'chakor' and 'chauras or whether 'bhoogol' was geography only or something else. Also we were asked to ask questions on Hindi language. Hindi !!.. what do you ask on Hindi subject?? Also we, so used to speaking 'Hinglsih' now, had some difficulty communicating in hindi without the influx of english words in between. Scores of chocolates, pens, wafers were distributed during the session. We had 3 trophies to give away. The 1st one went to a very confident girl. She had not enrolled in the computer course but the way she summarized what all had been said, left no doubt that she deserved it. The second went to the studious guy. He was soft spoken and a bit shy. But he came out and answered the ‘tough’ questions and in his low pitched voice gave his own interpretations of the world of computers and their uses. For the 3rd we made 3 -4 students to summarize everything. The trophy went to a girl who had actively participated during the whole event. I hope that we made those young bright minds a bit more aware, bit more confident, and helped overcome their shyness by recognizing them in front of everyone. This was a small effort on our side. And the experience has enriched me and given strength to my belief that India is indeed shining – not only in software companies of Bangalore or call centers of Gurgaon or number of McDonald’s being opened or sprawling malls but here in small villages at the root level where the future of India is being written. Yes, there are problems which will be always there but those can be overcome if we have the will. And if we spare some of our efforts towards this side – in a hope to strengthen the base to build a strong country tomorrow. The greatest indicator of the zeal of students, the enthusiasm, the will to learn and perform and if I can immodestly say, success of our program came at the end. After we had distributed 3 trophies, one 7th class kid came up to me and said in Punjabi, “Next time when you come, that trophy will be mine”. I was speechless. Nice narration of your experience. I am sure if some more companies like Infy come forward , the face of rural India will change. Young blood is always full of enthusiasm to learn, only the circumstances drive them away from their goal. That's really a very good experience. Infy has some good initiatives, I sometimes feel sorry I got out of Infy so early. Chal aakhir-kaar toone koi achcha kaam toh kiya. for me as well as our team. @fleiger: dont know if we can give them money directly as it is a govt institution and the point of contact will be the DPO or the local head of education deptt..but infy has offered to donate old computers to the school. and we got the necessary forms signed from the school..
@rajendra, anoop: it was indeed a nice experience.. hope we can do it again soon. @amrut: for me too.. that line was the highlight!!! Good job!! !...am sure that experience you had would keep u going for a long long way...it gives a sense of worth to our being when we indulge ourselves in such social work and make diference in some way or the other...be it in tiny magnitude...wat say?!?! Hey this was great!! Putting down into actions things that you desire to do, for the country for the youth, for the future. Sometimes you get a chance like this, somtimes you have to steal one. Great work Sid!! Keep it up.. dont let the flame blow off easily!! Beta Mera bhi mann kar raha hai ki mein bhi kuch aisa karu.. Mast kaam kiya hai tune.. Tera jewan Pawan ho gaya..